The T-hanger's adaptability becomes clear in handling loaned artworks. When different types of screw loops or similar are used in an exhibition, the T-hanger makes handling easier and prevents theft of hung objects. Reusability, as well as quick and secure mounting make the T-hanger a good investment. The T-Hanger has been developed for exchange exhibitions, art in public spaces, art Galleries, museums and the discerning private collector. With a T-hanger in the wall, it will usually not be necessary to make any physical intervention into artworks loaned for an exhibition. The T-Hanger is also used in churches to secure freestanding sculptures and ornaments. The vertical screwthread conforms to the SI System. The lower nut enables the step-free adjustment in height without special tools. The upper cupola nut has an anti-theft function. The cupola nut can be mounted and removed with a special tool. The powerful horizontal screwthread has an angle of ascent which enables quick and secure mounting into wood or plaster, as well as into wall plugs for plaster, concrete and brick. The wood screw end with a plate witha 2 mm hole in one corner. The plate increases the load tolerance and spreads the pressure over a larger area. The plate also covers the screw hole, the 2 mm hole being used to fix the screw in a vertical position in porous wall materials. The T-Hanger is entirely manufactured in strong and durable industrial steel. Electric galvanisation gives strong rust and abrasion protection. For the model T-5, the accessory ""Ozzy"" is available, enabling hanging of round screw loops as well as oval and rectangular hanging devices which may appear on loaned artworks. Ozzy consists of two components, the lower one enabling adjustment of height and the locking of hanging devices of different types. The other component is a washer with a long tongue to simplify mounting and contribute to anti-theft function. The washer is not always necessary to secure the artwork, but is always included in the delivery. The T-Screw is used for quick and simple screwing in of the T-hanger into a wall. By using the T-Screw, both the T-hanger and the wall behind are protected from unnecessary damage and time for mounting is minimised. 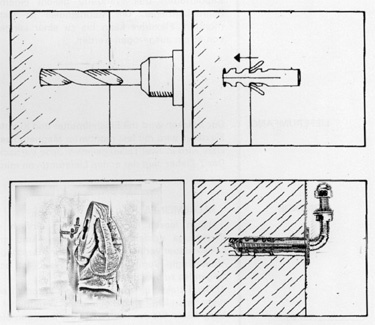 A T-Screw is included in a first delivery of at least 10 T-Hangers. The Flex drive allows you to mount or remove the cupola nut. The Flex drive which is extendable up to 45 cm is used as an ordinary screw driver. At the end of the Flex drive there is purpose made magnetic sleeve which will hold the cupola nut in the correct position. The T-Hanger is sold with adjustment nuts and lock nuts in packages containing 10 complete T-Hanger units. Flexdrive is delivered with a fixed magnetic sleeve. Ozzy is delivered in two parts. Each package contains ten complete Ozzy units. The T-Screw comes with the first order of 10 T-Hanger units. The T-Hanger is quick and simple to mount. The use of correct accessories makes it simpler to work effectively and to reuse the T-Hanger for many years. The T-Screw makes work even easier and ensures that the wall and the T-Hanger cannot be damaged during mounting. Whatever the wall material, the following points must be observed when the T-Hanger is in use: - The T-Hanger must be screwed into the wall by hand. If normal hand pressure is insufficient, then the hole or the plug is too small, or too shallow. Drill the hole and/or change the plug! - The vertical plate must never be screwed into the wall damaging the wall paint. The plate still fulfils its stabilising function even if it lies 3 mm from the wall. - Stabilise the T-Hanger when mounting in porous material with a pin in the plate hole. The pin must not be hammered fully into the wall. Leave 5 mm sticking out so that dismantling is quicker. The T-Hanger's wood screw is suitable for mounting directly into wood or wooden planks. A 3.5 mm pre-drilling simplifies the mounting. When mounting heavier objects in chipboard, the use of plastic plugs is recommended to increase the load tolerance of the hole in the chipboard. When mounting in plaster walls, the T-Hanger can be used without plugs if the objects does not weigh more than 5 kg. Predrill in the same way as for wooden planks. The drill diameter can be reduced to 2 mm. For heavier objects, a 6 or 8 mm plaster plug can stabilise a hole in plasterboard. When mounting in concrete or brick walls, suitable plugs must be used. See sketch. Follow instructions for predrilling and screw dimensions given with plugs.